In his article for the Daily Mail, Alex Miller claims that the marketability of Britain’s top female athletes prior to the 2012 games, has allowed them to negotiate endorsement pay rises, and also the chance to take on additional sponsors. “The highest profile female British athletes typically take on up to four major endorsements, each worth up to £150,000 a year”. 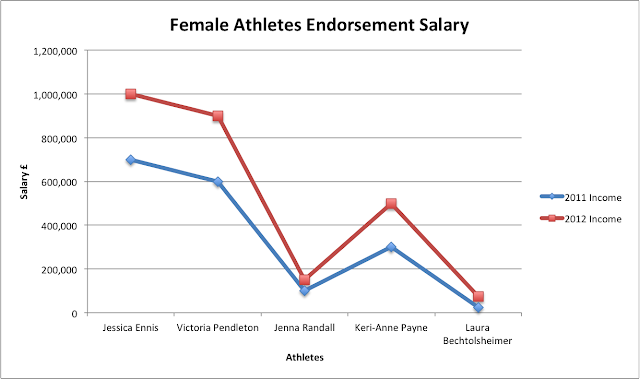 Jessica Ennis, Victoria Pendleton, Jenna Randall, Keri-Anne Payne and Laura Bechtolsheimer have been able to cash in on the games by substantially increasing their incomes. Each of these have noticed a major increase in their salaries from endorsements. The table below looks at the difference between their 2011 income and their 2012 income. This table compares the female athletes and looks at their sponsors, and how they have changed in the last 12 months. Jessica's sponsorship deals with Powerade, Aviva, BP and Olay are estimated to be worth around £150,000 each. Her contact with Aviva requires her to only work six days a year, so that her training schedule remains untouched. Her kit sponsorship deal with Adidas is thought to be the biggest deal for a Team GB athlete, the deal is estimated to be worth around £320,000 including performance related add-ons. In the last twelve months Victoria Pendleton has been able to take on three new sponsors, which has allowed her income to increase by 50 per cent. Her lucrative sponsorship deal with Hovis is estimated to be worth around £150,000 - the deal involved TV, print and on-pack promotions. Keri-Anne Payne's new sponsorship deal with Max Factor is set to be worth around £70,000 a year. This year female sponsorships have been significantly increasing, and these five women are set to become some of the highest paid athletes in the run up to the 2012 games. Nice roundup - but you could do a lot more with the visual support. Be clear what your story is here - if it's about increases then your visual element should focus on that, providing a visual representation beyond numbers (bars, lines, ideograms). Also, can you put them alongside each other so we can compare them?